For one of my projects I had to decide for an object relational mapping (ORM) solution to be used in a web environment. There is not much to think about when deciding which framework to use. Yet, I wanted to try out Eclipse CDO  as an alternative to, for example, hibernate. 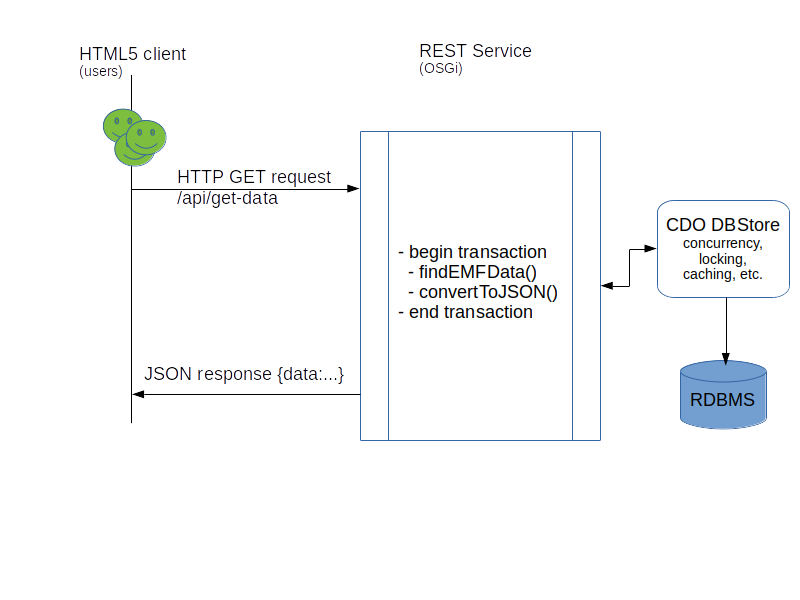 The following sketch shows the involved steps when a user (HTML5 client/browser) sends a HTTP request to a service that consumes the CDO storage. The web application is driven by (JAX-RS) REST services, so any call/request is served by the appropriate REST service. For each call which requires DB access, a new CDO transaction is opened, the request is processed, the result is converted to JSON and the transaction closed/committed. Conversion of EMF model instances is done using Eclipse Texo  in most scenarios, but special view models are also created using a JSON java library like org.json . Have you ever considered using CDO as an ORM solution? Or are you already using it in a web context? What are your experiences? I am currently using CDO in a very similar setting (web application, REST interface, OSGI, Jetty). Thanks for your great feedback, Maximilian! 4. In my case, each user has its own resource, so I also traverse that resource in top-down direction when searching for a specific entity. When using custom SQL queries you have to make sure you do not return any entities outside the user's resource.